Starting with the stage play “Endless Shock” Johnny’s has decided to increase the price of the regular goods for their concerts and stage plays. This includes Uchiwas, Clearfiles, posters, and pamphlets. The goods have been the same price for over 15 years now and the company decided to increase the prices as of February 1, 2014. Pamphlet: 2000yen —> 2200 yen *This depends on the stage play and show, some pamphlets are larger than others, but this is the base price. Though the company states that the reason is the sharply rising costs of making the goods in the past few years, this probably also has to do with the increase in consumption tax that Prime Minster Abe has helped implement in Japan, though the company didn’t say that it was directly a factor in its statement. This increased consumption tax that will begin in April, raising the tax from 5% to 7%, then in a few years time increasing it to 10%. This means that buy an item at a 100 yen shop now, now you have to pay 105 yen per 1 item. 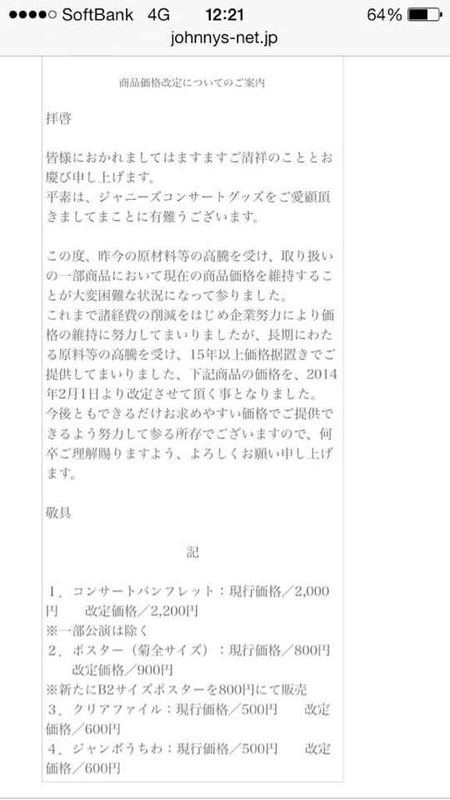 In April, it will increase to 107 yen for 1 item, and later 110 yen per item. My thoughts: I think this is a smart move on Johnny’s part, as a company. Some of the fans on twitter don’t seem to be pleased with this, but because the company has had the same prices for their goods for 15 years and there is a increase in consumption tax implemented by the government starting in April, Jonny’s has no other choice but to raise the prices of goods. Also, as time passes the value of money depreciates, thus having to increase the prices of goods. The value of money today isn’t the same as what it used to be 15 years ago. Well, fellow fangirls! Be prepared to dish out more money on goods from here on out!